Kofi Annan, the diplomat and peace maker who lead the United Nations for a decade, has died aged 80. 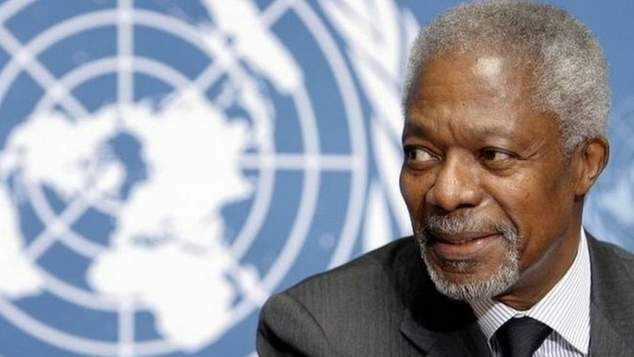 Annan became the head of the United Nations in 1997 and remained in the role until 2006. He was the United Nation’s seventh Secretary General. In 2001 he and the organisation he lead were jointly awarded the Nobel Peace prize. The award recognised his renewal of the organisation and it’s commitment to human rights. The committee awarding the prize also noted his contribution to stopping to spread of HIV/AIDS and his staunch opposition to terrorism. In 2016 UNAIDS awarded Annan the UNAIDS Award for Leadership recognising his contribution to the global fight against HIV. Under Annan’s leadership, in 2000 the United Nations Security Council adopted resolution 1308, identifying AIDS as a threat to global security. In 2001, he held the first United Nations General Assembly Special Session on HIV/AIDS and called for a global fund and “war chest” to respond to HIV and other infectious diseases. His call led to the creation of the Global Fund to Fight AIDS, Tuberculosis and Malaria, which by 2016 was supporting 8.6 million of the 17 million people accessing antiretroviral treatment. Annan was born in Ghana in 1938. After studying economics he received a scholarship to complete further education in the USA. In the early 1960’s he began working for the World Health Orgaisation, a division of the United Nations. Over the next four decades he worked in a variety of positions in the United Nations. In 1980 he became the head of personnel for the office of the UN High Commission for Refugees in Geneva. In 1983 he became the director of administrative management services of the UN Secretariat in New York. From 1987 until his appointment to the Secretary General role Annan served as an Assistant Secretary-General of the UN in three consecutive positions: Human Resources, Management and Security Coordinator (1987–1990); Program Planning, Budget and Finance, and Controller (1990–1992); and Peacekeeping Operations (March 1993 – December 1996). His position in Peacekeeping Operations saw him involved in the peacekeeping missions in Somalia, Rwanda and Bosnia. In 1996 he was appointed to lead the United Nations replacing Boutros Boutros-Ghali. Kofi Annan passed away in Bern, Switzerland after a short illness. A statement from his foundation said he was surrounded by his wife and children.